Within a decade, Monash will be known as the Australian university with the greatest impact on social mobility, through its capacity to recognise, support and extend talented students from educationally disadvantaged backgrounds. Access Monash encourages and supports increased access, participation and success of students who are under-represented in higher education, particularly those from low socio-economic status (SES) communities. Our work supports Monash University's Widening Participation Strategy and Focus Monash Strategic Plan, which lists Inclusion as a key goal. We work in partnership with schools to engage students with higher education through outreach activities that we offer in-school and on campus at Monash. We specifically target low SES areas in Melbourne's southeast and regional Victoria. Find out more about our outreach programs and activities. View a list of our partner schools. 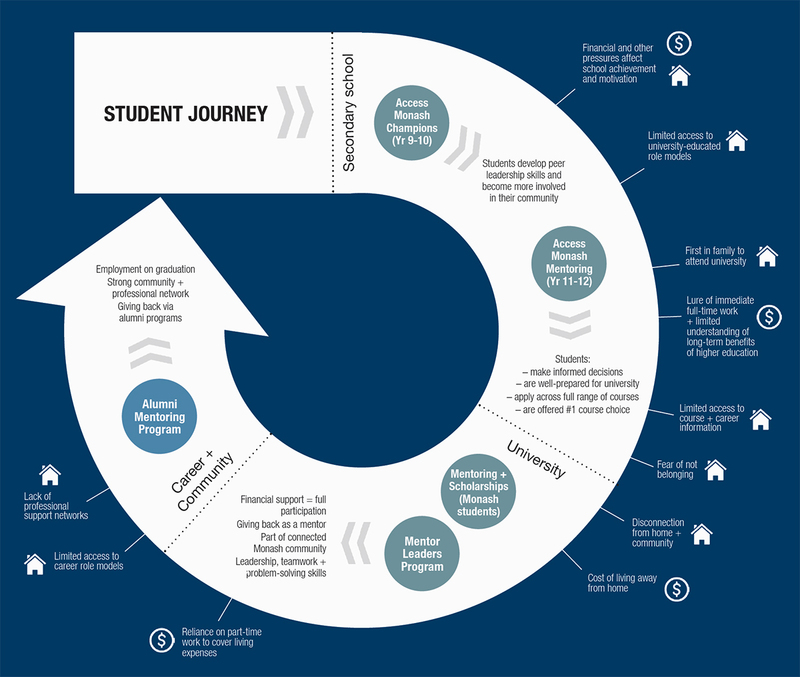 Our unique Program Cycle is designed to support students in mentoring relationships during late secondary school, in their transition to university, during their studies and beyond into the working world. We are committed to providing a range of flexible pathways into Monash courses for students who may not meet the entry requirements for their chosen course. We also recognise that ATAR scores do not always reflect students' potential to succeed at university. With this in mind, we improve the recognition of talented students who have experienced disadvantage during their education by providing special admission schemes. Visit Entry Schemes for more information. Our job doesn't stop once a student is enrolled. We provide transition support for students admitted to Monash through special admission schemes to optimise their progress, likelihood of success and future options, through faculty-based and university-wide programs. Faculty-based mentoring and transition programs.